An RC Raider in GTA Vice City. The RC Raider is basically identical to the RC Goblin, but is distinguishable by its dark green body. Performance wise, the RC Raider is faster than the RC Goblin due to its ability to pitch steeper, but possesses far more sensitive controls that leaves the RC Raider prone to flying upside down. Much like the RC Goblin, the spinning blades of the RC Raider can be used to execute heli-kills on pedestrians. The blades also have a change in color from GTA Vice City to GTA San Andreas. In GTA Vice City, the RC Raider can only be controlled through a Top Fun RC mission in Escobar International Airport; the only way to obtain it outside the mission is to use a third-party hacking device or modification to spawn the helicopter. 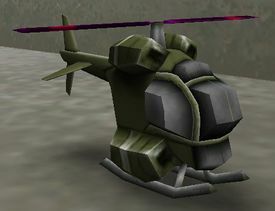 The RC Raider also exists in Grand Theft Auto: San Andreas and Grand Theft Auto: Liberty City Stories but it is never used in any of their missions and thus can only be obtained through the aforementioned third-party software. However, in San Andreas, Zero is seen flying an RC Raider during the mission Wear Flowers in Your Hair. If you kill Zero during the mission, he will drop a detonator (which was presumably repurposed to be a remote controller). However, if you pick up the detonator and use it, nothing will happen and it will disappear. This page was last modified on 23 July 2012, at 23:34.